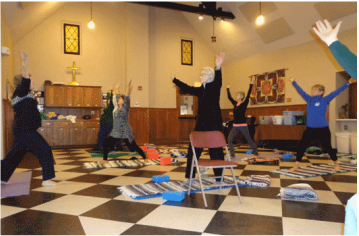 Karin Randolph, a certified yoga instructor, offers yoga classes in the Parish Hall on Mondays at 3:15 PM and Fridays at 10:30 AM. These are gentle classes in the Kripalu tradition, which emphasizes bringing body, mind, and spirit into harmony. Yoga seeks to normalize joint movement and range, trains the mind in focus and calm, and for the spirit, deepens self-awareness. Classes are attended by men and women alike, and they last approximately 1.5 hours. You need only show up in comfortable attire – yoga mats are provided or you can bring your own. There is a $6 fee per week (you may take one or both classes for that fee; it is the same class given twice in one week). For questions, email Karin Randolph here or call 715-356-7733. Namaste!